Kenya Private Sector Alliance (KEPSA), through its social arm, KEPSA Foundation, on Saturday 30th June 2018 launched the Kijani Movement; an initiative geared towards promoting environmental conservation with particular focus on afforestation and re-afforestation. The initiative seeks to influence tree planting across all sectors towards attaining the national 10 percent forest cover by 2022. Latest studies indicate that globally, forests are being depleted at an alarming rate of 20 million hectares a year. In Kenya, the consequences of this depletion range from an increased risk of drought to recession in the economic development and a rise in the cost of living. As a response to this growing challenge, KEPSA is actively engaging with government on policy and policy implementation around forestry and environmental conservation through the Environment, Water and Natural Resource Sector Board. The initial action of the Kijani Movement is to set up the Feed and Green our Institutions program; a drive that seeks to partner with educational institutions in the creation of solutions that will contribute towards the overall greening of the nation. This successfully commenced on Saturday 30th June 2018, at Mangu High School and was graced by AMB. (DR) Amina C. Mohamed, EGH, CAV Cabinet Secretary for Education and KEPSA members drawn from Bidco Africa LTD, Coca Cola Beverages Africa, Madison Insurance among others. 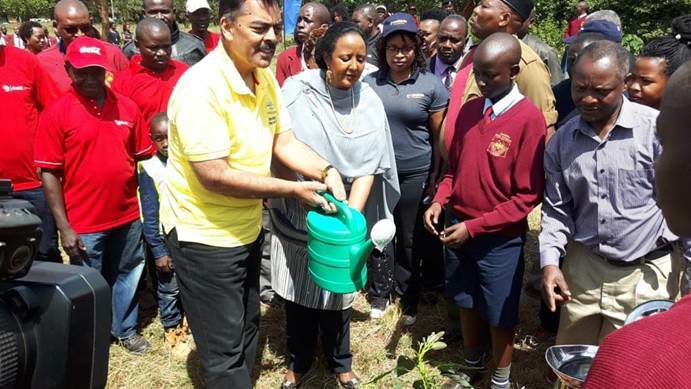 Speaking at the event, where she joined the students in planting orange, mango and avocado trees ideal for the tropical climate in Mangu, the Cabinet Secretary stated that taking care of the environment is everyone’s responsibility and we all must be ready to take up that role. 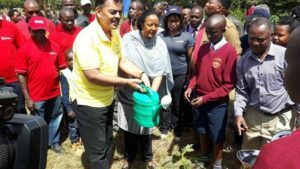 Her sentiments were echoed by KEPSA Trustee who is also the Bidco Africa Chair, Dr. Vimal Shah, who urged schools to embrace the fruit tree planting program in order to diversify school diets. “The surplus can be bought back by the private sector for Agro processing.” He said. Ms. Rachel Muthoga, KEPSA Deputy CEO, stressed on the need to give the future generations a better environment stating that KEPSA Foundation’s mandate is to ensure a year on year strengthening of the socio-economic transformation of the nation by engaging and devoting resources to socio-economic development of the country.